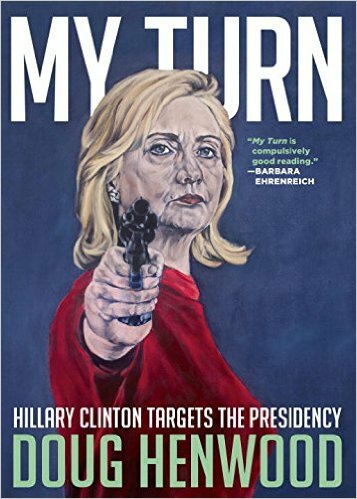 My wife and I got so caught up in the Presidential election that we had some fascination with Hillary left over afterwards, so last week we treated ourselves to a read of this short book denouncing Hillary Clinton from the left. It’s an expansion of a striking article that Doug Henwood did for Harper’s back in November of 2014. Many lefties and Hillaryites were furious with Henwood for undermining their candidate. Is it better to be honest about a politician’s failings or to do propaganda for what one feels to be the lesser of two evils? The state did all kinds of business with Rose [law firm], from routine bond issues to more complex litigation. Having the state do business with a law firm that employed the governor’s wife seemed a little smelly to many. But, no matter — the Clintons would soon be leaving town. Ambitions as expansive as theirs couldn’t be satisfied in the Ozarks. Henwood has a wry, sly and biting sense of humor that makes a nice counterpoint to his generally measured tone, his ferocious researching and his fervent leftie principles. “She swears like a longshoreman, one of her more endearing traits,” he writes. There’s certainly nothing that’s proper in an uptight-rightie kind of way in him. It’s a fast, amusing and enlightening read. Henwood is more concerned with nailing down facts than with Hillary’s psychology, which he lets speak for itself and which is fun to speculate about afterwards. I’d love to buy Henwood a drink and get him to talk about what he really thinks is going on with her. What a fascinating, if also appalling, character Hillary is. My wife is deeply convinced that Hill has immense “who am I really?” identity issues and is likely crazy. What would Henwood say to that? Full disclosure: though we’ve never met up in person I’ve been in touch in small ways with Doug Henwood for years. Back in the 1980s I subscribed to his great ‘zine Left Business Observer, I learned a lot about how the world works from his book “Wall Street,” and I currently follow his regular provocations on Facebook with interest and delight. Doug’s also an excellent radio interviewer. Check out his very interesting archives. Sarah Sole is the artist who did the book’s striking, and instantly controversial, cover image. This entry was posted in Politics and Economics and tagged Doug Henwood, Hillary Clinton, politics. Bookmark the permalink. There seems to be a bit of a false dichotomy here: either you’re an unprincipled opportunist or a principled left liberal. While I’d agree she is most concerned about acquiring power and money, I also don’t doubt that Hillary genuine left wing sympathies. “Hillary has worked very long and very hard over a long period of time, and we owe her a major debt of gratitude for her service to our country. And hey, if you can’t believe President Trump, then who can you believe, amirite? Beating a dead horse much?